2017 Success! Dave Collins N4WDC again lead the effort in 2017. See the summary spread sheet. 2016 Success! Eric, WG3K manned AO mountain this year. 2012-2015: David Collins, N4WDC along with Andrew Barber N7ASB and Jim Steele, NX4Q operted in 2012 and combinatinos of them through 2015. They camped in the valley the night before at Cave Mountain. Brian WA1ZMS the normal AO mountain repeater guy will (hopefully disable the 1 kW em beacon and)loan a cavity filter for 144.34. 2011 Success: David, N4WDC, Chuck, K4QS and Jim, NX4Q formed the successful team for 2011. They were primarily a SOTA bunch who became aware of the opportuniy only in the last weeks or so. As a SOTA group they were also prepared with HF gear for 20m or 40m CW for some SOTA activations Saturday and Sunday as well. 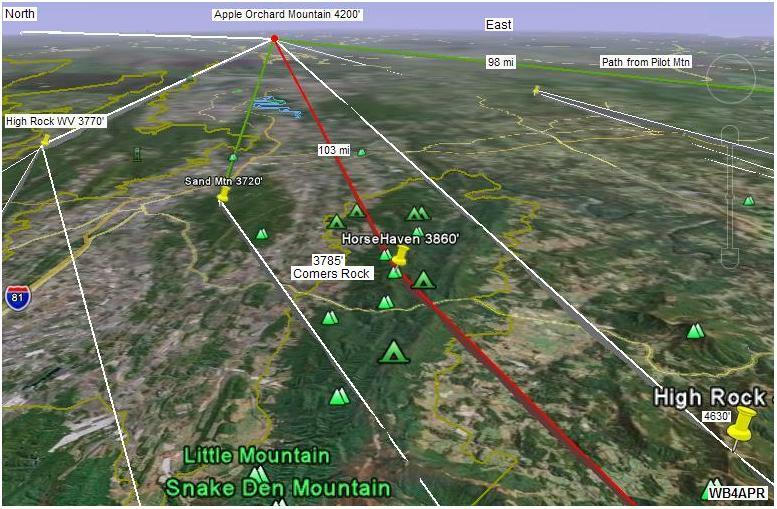 Notice the alternate path used in 2011 shown in red to the right to Hawksbill Mouintain. See their 2011 report. Also see how they moved a few hundred feet away from the FAA radars and 1 kW 2 meter beacon to reduce RFI. 2010 results: Geep Howell re-tuned the existing digi to 144.34 and attempted to set up the HOP7-7 and TEMP7-7 support. But he was flustered by the Kenwood obscure (*) key that is needed to actually activate the OTHER PATH setting in the radio after setting it up. So HOPn-N was not supported and adjacnet sites did not see anything. Of course Comers Rock was unmanned so there was no one to see it to the south anyway. 2009 results: In 2009, Apple Orchard Mountain was operational, having been set up the day before by changing out the existing APRS digipeater with a properly configured D700 for the event on 144.34. The site was unattended during the event, though the sysop was monitoring the co-located 146.685 repeater. See 2009 report. It was not heard to the south because Comer's Rock was not activated due to sever weather and probably was not seen to the north because White Rock Cliffs only became fully up towards 3:30 or so PM? See the Golden Packet plan. . This is one of the 15 hill-top sites from Georgia to Maine we hope to visit this summer on 26 July for 6 hours to attempt to relay a text message using hand-held radios the 2000 mile length of the Appalachain trail. This is to be a no impact Leave-No-Trace type of event of a few individuals at each site. . Other hikers equipped with APRS ham radios are welcome to participate. TEAM INTEREST:. . . . . Geep is setting the digi on 144.34 on 20 July! INTERFERENCE: . . . . . 144.285 CW Beacon aimed at Europe 1KW and other repeaters listed above. Apple Orchard Mountain at 4200 feet is an excellent VHF operating site just off the Blue Ridge parkway just a few miles Northeast of Roanoke Virginia. It is a non public site but has a broad peak with easy access and the AT passing within yards of the FAA radar building. INTERFERENCE: The very high power CW beacon less than 100 KHz away from our operating frequency is a real killer. The only way this can work is if we can get that turned off for the part of the day of our half-day or less event. In the view above, the FAA facility is clearly visible with the access road from the left going down a short distance to the Blue Ridge Parkway. The RF paths to the Southwest to Sand Mountain and Comers Rock and to the North to Mill mountain are shown. This view to the southeast does not show the RF paths well, but was chosen because it shows the general layout of the mountain top and radar tower in the best perspective. Geep Howell [geep * wa4rts.net] back in the early years went to the site around 9 AM to swap out the existing digi on 144.39 and add a D700 on 144.34 and then came back later to reconfigure back to normal. He will also shut down the KW ERP DX beacon only a few Khz away. The site 30 miles north of Roanoke "military site" was a USAF radar site during the Cold War. Closed in 1978. 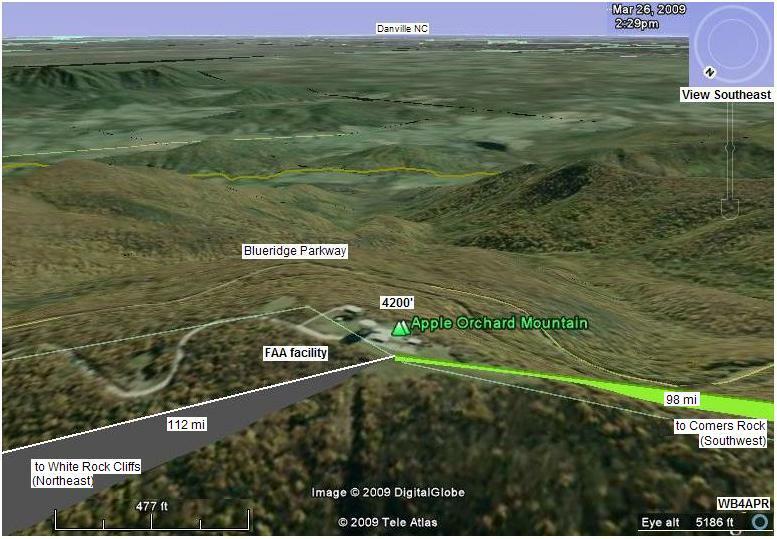 It now is only occupied by the FAA and is located on Apple Orchard Mountain, ~4200' ASL. The AT does cross within 100 yds of the radar station. It does not have "public vehicle" access, but with planning there is access for a vehicle. Also, there is a 144.285 CW Aux station (operating in beacon mode) on this Apple Orchard site with the antenna aimed 60 degrees toward Spain for North Atlantic propagation studies. It runs about 1 KW ERP. It is slow speed CW and the carrier is on for about 30 seconds between ID. You should hear it in MD with a wet noodle. In the next photo looking west-southwest, the post is a trail marker for the AT.